In my last blog, I argued that China’s balance of payments position is still strong—despite the possibility it might end up running a small current account deficit in 2019. The twenty prior years of surplus created a big buffer of assets, even if that buffer is a bit more hidden than it used to be. Turkey, in a sense, is in the opposite position. Its current account has swung from a large deficit (around 5 percent of its GDP) to a small surplus. But the legacy of the external deficits Turkey ran over the last ten years hasn’t entirely gone away. 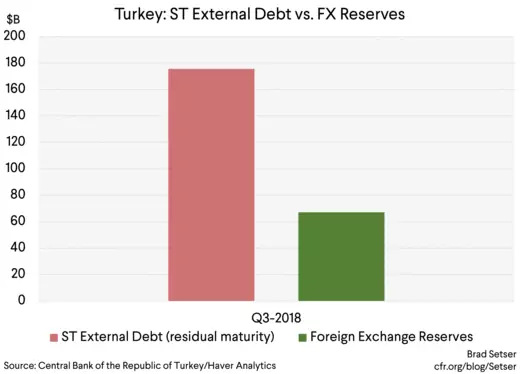 Its balance of payments position is much improved (at an enormous cost to Turkey’s economy; the current recession will be deep) but it retains a residual vulnerability because past deficits left it with a lot of debt relative to its reserves (to be fair, the banks have a buffer stock of liquid foreign currency assets of their own as well). Vulnerability doesn’t mean imminent crisis, or a new bout of weakness in the lira (though I might worry a bit if Lebanon slips into a sovereign debt crisis). But it does mean that Turkey might be in a position where it needs to run a balance of payments surplus for a while—and since Turkey is a low savings country, that implies that Turkey's economy won’t bounce back quickly from its current slump. A lot has happened since I wrote about Turkey back in August 2018. Back then Turkey looked at risk of a deep crisis, one that might eventually force Turkey to either turn to the IMF or allow some of its banks to default on their external loans. That didn’t quite happen—credit collapsed, the government raised interest rates, the banks survived thanks to regulatory forbearance (and a relatively high capitalization ratio), the balance of payments improved (thanks to a big fall in imports, lower oil helps Turkey a lot), and the lira stabilized. But all isn’t well. The banks external creditors have steadily been pulling funds out of Turkey. They pulled about $15 billion out in the last five months of 2018 (we don’t yet have data for December). That all looks rather like a classic sudden stop. The money rolls in—and out. Inflows turn into outflows. And there is a reasonable risk that this outflow continues. Something like $40 billion in long-term loans will mature over the next twelve months. 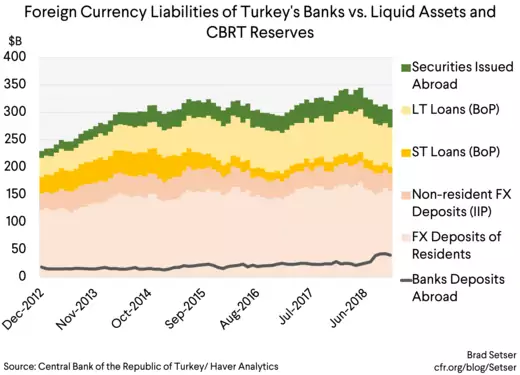 In addition to the withdrawal of loans, external creditors still have around $32 billion in deposits in Turkey’s banks—the deposits have been relatively stable (compared to the loans), but they still remain a risk. But all is not dark. 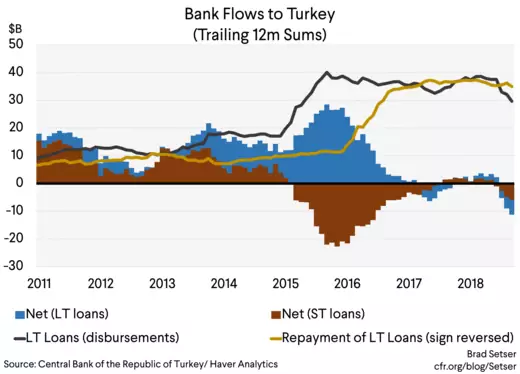 Turkey has benefited from an offsetting, stabilizing flow even as external creditors pulled funds from Turkey's banks. The government has been able to raise a decent amount internationally by borrowing in foreign currency over the last few months. 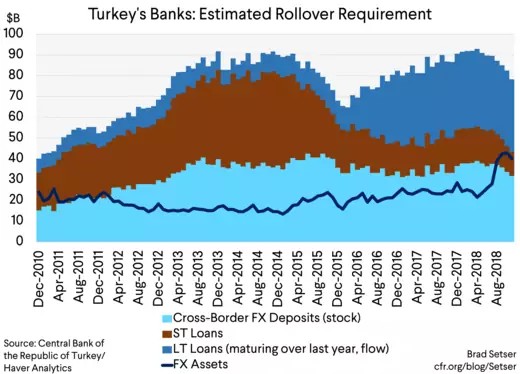 And the central bank got a bit more—thanks to $3 billion that was put on deposit at the CBRT (this likely came from Turkey’s ally Qatar, and it looks to be structured as a swap, the central banks forward position has moved by a similar amount). All told the government and the central bank raised something like $10 billion in the last part of 2018 (and look to have raised a bit more in the first weeks of 2019). But so long as the some of the claims are rolled over and so long as the government can continue to borrow, a modest current account surplus is all Turkey needs. I can imagine three scenarios—for the balance of payments, but also for the broader economy. Government re-leveraging (e.g. external borrowing to support a growing fiscal deficit) drives a rebound in the economy and pulls in funds from abroad. Government borrowing—and foreign inflows back into the Turkish lira bond market—could be strong enough to offset a more modest pace of roll-off in the banking sector. 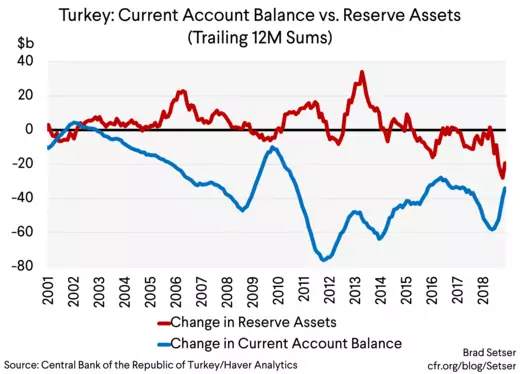 The net inflow into Turkey would be strong enough to allow Turkey to fund a small current account deficit again—or, if it chose to be more financially conservative, to rebuild reserves. Turkey in other words would start to look a bit like—in a balance of payment sense—Argentina back in 15 and 16, when private demand for its bonds funded both a fiscal and current account deficit. The current equilibrium. Foreign demand for the government’s paper is strong enough to cover the ongoing roll-off of the banks’ external financing. The current account remains in a small surplus, the economy remains in the doldrums. Renewed trouble. Turkey’s fundamental vulnerability going into 2018 was two fold. It needed ongoing inflows to cover its current account deficit. And its large stock of short-term debt (and the large stock of domestic foreign currency deposits that might run in an extreme scenario) relative to its reserves created vulnerability to a run. The current pace of roll-off isn’t anything that the banks cannot manage out of their foreign exchange liquidity buffers—the banks have, per the balance of payments, $40 billion in offshore deposits and they still have funds on deposit at the CBRT (counted as part of the central bank’s reserves). $40 billion in long-term debt is coming due this year and there is still $10 billion in short-term lending that might roll-off. If the rollover ratio is around 50 percent, the outflow is unpleasant—but manageable. If the roll-over rate falls though, it gets a bit more difficult—and there is always a risk that the broader foreign currency deposit base might panic. My baseline is essentially the second scenario. The Fed increasingly looks likely to be on hold for much of the year. The government hasn’t exhausted its capacity to place bonds abroad, particularly if U.S. Treasuries yield under 3. Plus oil prices are down—and that really helps Turkey. And while I wouldn’t really want to lend money to a Turkish bank unsecured and take the risk that the government at some stage concludes that the banks uninsured, non-deposit creditors are a source of contingent capital—given the large losses likely sitting on the banks’ consumer lending book and on a portion of the banks foreign currency book—the odds are that Turkey makes all the banks’ creditors whole one way or another so long as it has access to sufficient foreign currency liquidity. Spreads have come in; for now the market is less worried than I am. What might put Turkey back into real trouble? Deeper than now expected difficulties in the banks—likely starting with the state banks. The banks are short on capital (in my view) and potentially short on foreign currency liquidity. NPLs tend to rise with a lag—and given the scale of the lira’s 2018 fall and the depth of the economic contraction, the losses inside the banking system are likely to be large. I suspect a couple of banks will need government recapitalization, not just regulatory forbearance. At current interest rates, the interest margin the banks earn on their lira lending should be steadily falling as funding costs have jumped faster than lending rates (buffered to a degree by the bank’s holding of floating rate government debt). A sharp fall in the roll-off rate or a pickup in deposit outflow (whether from residents or non-residents)—or a renewed bout of lira volatility that forces another rate hike and thus puts more pressure on the banks lira funding costs—could put Turkey on a less comfortable path. And, of course, the other trigger is a renewal of Turkey’s fight with the Trump administration. Over Syria. Or over the Iran sanctions. The post “Brunson” truce may not last…even if it seems like President Trump on occasion takes more advice from President Erdogan than his advisors find comfortable. * I used the balance of payments data to calculate the amount of medium to long-term bank loans that came due in the last twelve months and used that number as my "easy" estimate for the amount coming due in the next twelve months. You could also do a more formal estimate, but this is an easy way of getting a continuous time series.